IN NEW MEXICO, WE’RE PROUD of the way Native, Hispanic, Anglo, and other cultures blend into one delicious culinary tradition. Just look at one of our most beloved dishes, the breakfast burrito: indigenous green chile, Anglo-American bacon, and a Spanish flour tortilla? All three melt together to create something uniquely New Mexican. But if you want to take a closer look at just one tradition, it can sometimes be difficult to isolate. Restaurants serving Native cuisine are few and far between—unless you know where to look. This month, we’ve gathered our favorite recommendations for places where you can enjoy some of the same dishes that local families eat at home today, and explore a new trend of pre-contact food, made only with ingredients available in the Americas before the arrival of Europeans. Traditional or daring, humble or elevated, it’s all fascinating and delicious. On the road to Taos Pueblo, just past Taos Mountain Casino, in a traditional adobe they built themselves, Ben and Debbie Sandoval serve the same menu they started 25 years ago. It’s true Taos comfort food, as close as you can get to being a guest in their home. You’ll see the two of them padding around the kitchen, waving at regulars, popping out of the swinging doors to run the cash register. The vibe is welcoming, informal. The menu may seem slightly unusual to newcomers, but to Ben Sandoval it couldn’t be more familiar. “It’s the same as the grandmothers taught us,” he says. “All the foods they taught us to make on feast days—we follow in their same footsteps.” That means you’ll find red chile stew with a side of bread baked in the traditional adobe horno out back and a plate of bison meat served with the ancient trio of squash, corn, and beans. The Tiwa Taco starts with blue corn fry bread layered with ground bison, chile, beans, and cheese, topped with lettuce, tomato, and onion. For dessert there’s a low, flat rectangle of traditional prune pie or Ben Sandoval’s twist on tradition: piñon-prune-apple pie. Albuquerque’s Indian Pueblo Cultural Center is the best place to soak up the traditions of the state’s 19 pueblos—and its restaurant has long been one of our favorites. “We’re not just a restaurant in the cultural center,” says Executive Chef Brent Moore. “Here, eating is part of the cultural experience, part of the learning process.” Earlier this year, the restaurant got an update, with a revamped menu and an expanded scope. While still centered on Pueblo cuisine, Moore also focuses more broadly on Native foodways by sourcing ingredients from all across the country for a menu divided between “pre-contact” and “post-contact” dishes. The result is highbrow and lowbrow, deeply authentic, and ambitiously creative. A starter of bison carpaccio is seasoned with sumac, paired with pickled fiddlehead ferns, and seasoned with pumpkin oil—all ingredients available in the Americas before European contact, but put together in a very modern fashion. Meanwhile, you can still get an Indian taco, a bowl of red chile stew, or the Pueblo Feast plate, with tastes of two stews, enchiladas, beans, calabacitas, fry bread, oven bread, a blue corn muffin, and Pueblo pies. Above: Blue corn chicken and waffles from Pueblo Harvest Cafe. The first thing you’ll notice about a Navajo meal is the mutton. At AshKii’s, you might find smoky grilled mutton ribs, mutton stew, or slices of roast mutton with green chile. Owners Bernice and Dexter Begay started with a food stand and graduated to this casual counter-service lunch spot on Farmington’s main drag. 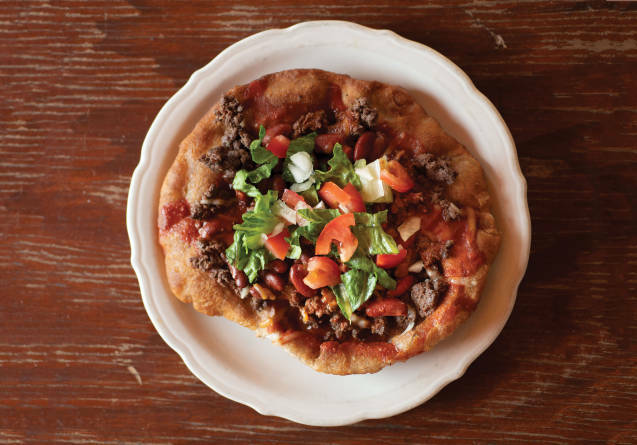 The giant, crispy fry bread is the bed for a Navajo taco and an inventive Navajo pizza. It’s an absorbent dunk for steam corn stew (dried corn rehydrated in a mutton broth) and the wrapping for a giant hamburger or Grandpa’s Favorite: grilled slices of Spam with fried potatoes, onions, squash, cabbage, and green chile. For dessert, try a plate of blue corn pudding. Check Facebook for specials. Locals gather at this city-run community center to socialize and share an inexpensive meal in the no-frills café, but visitors are always welcome, too. An all-Navajo staff prepares breakfast burritos in the morning and home-style lunch dishes like dumpling stew with mutton, Navajo tacos, and Spam sandwiches. At $6, the Navajo Burger is the most expensive thing on the menu, so feel free to over-order and taste a little of everything. Whatever you do, don’t miss the tortillas, which are handmade to order. “It’s a pretty popular place, so get here around 11 if you’re wanting to try something in particular,” says director Myra Newman. All the food is authentic, she says, but the most popular dish is the dumpling stew, which usually appears twice a month on the stew-of-the-day menu. “It’s a hearty meal with plenty of dumplings, but the majority of the flavor comes from the mutton,” she says. Do as the locals do and garnish with preserved yellow chiles. This gluten-free, vegan corn pudding is part of the pre-contact menu at Pueblo Harvest, where it is served with pan-roasted goose breast and amaranth salad. You can use yellow or white cornmeal, or look for red cornmeal at Southwest Heritage Mill in Albuquerque (505-217-9433, southwest heritagemill.com). You can find freeze-dried corn kernels in the snack section of most natural foods stores. In a saucepan over medium-high heat, combine water, walnut milk, agave syrup, and corn kernels, and bring to a boil. Whisking constantly, slowly add the cornmeal. Reduce heat and simmer 5 minutes. Add salt to taste and garnish with freeze-dried corn. Store-bought walnut milk works fine, too. In a medium mixing bowl, combine the walnuts and enough water to cover by 1 inch. Cover and rest at room temperature at least 1 hour or overnight. Drain walnuts and rinse under running water. In the pitcher of a blender, combine walnuts and 3 cups water. Blend on low until smooth. Add salt to taste. 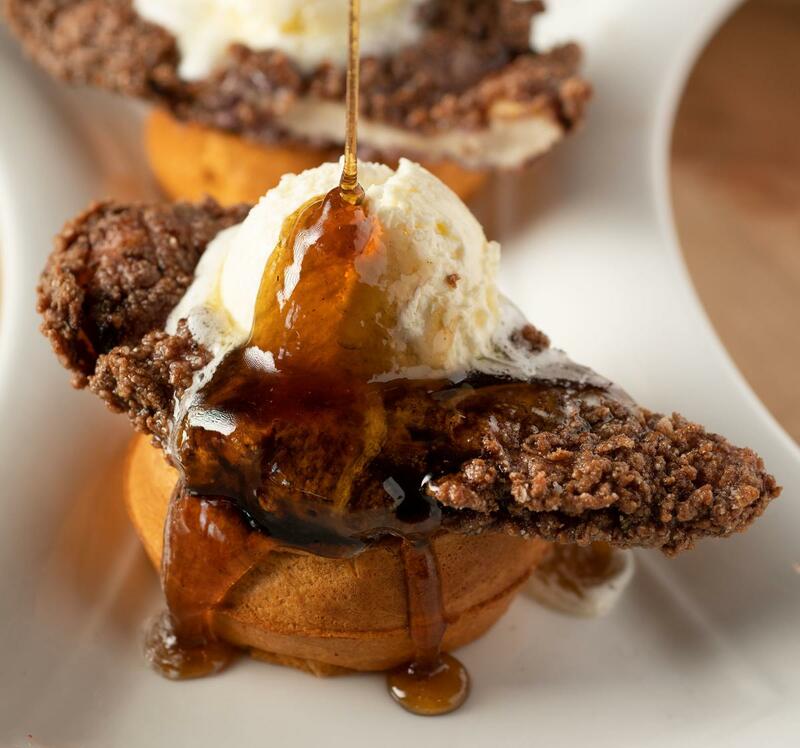 At Pueblo Harvest, this local take on chicken and waffles is served with green chile maple syrup and piñon butter. If you don’t have red chile sauce in the freezer already, you can make a quick one with a recipe from our website (nmmag.us/red). In a medium mixing bowl, combine all dry ingredients. In another bowl, whisk together wet ingredients, then stir into dry ingredients. Do not overmix. Let stand 10 minutes, then cook in a waffle iron according to manufacturer’s directions. Blue corn delivers an extra-crisp texture. In a large bowl, toss chicken breasts with buttermilk, cover, and rest, refrigerated, 1 hour or overnight. Mix cornmeal, flour, salt, and pepper together and place in shallow baking dish. Remove chicken from milk and dredge liberally in cornmeal mix. Fry at 350° for 7–10 minutes or until cooked through.